Turtle Garage recently won the Powerball! For years I have been corresponding with pre-war BMW expert Robert Freeman. 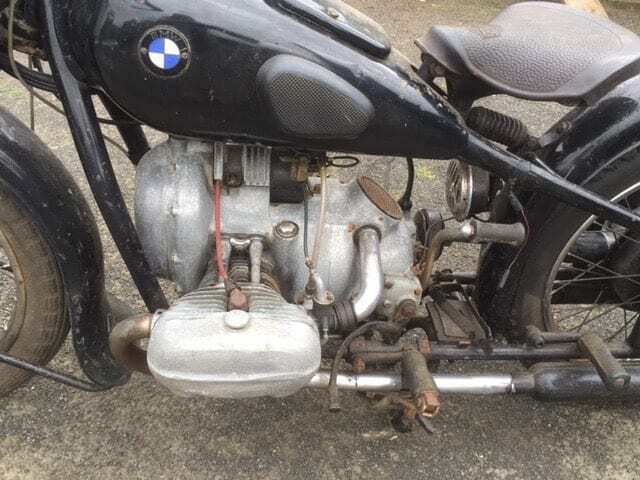 Robert lives in England and is the Yoda of pre-war British BMW motorcycles. Back in the 1960’s Robert purchased HMK 377 (currently my BMW R5) for eleven pounds sterling. At a time when nobody cared about these special machines, Robert saved this legendary motorcycle from the junkyard. Robert has been responsible for helping me properly research and restore the R5. He also helped me research the rich history behind JML 649 (my 1938 R71). Most recently, he helped me find and negotiate a deal to purchase what is likely the last unrestored original authentic AFN BMW left in Great Britain. Some background: When I purchased HMK 477 in 2001, the bike came with a very large file full of documents. I was able to track Robert down as a former owner of HMK 477. 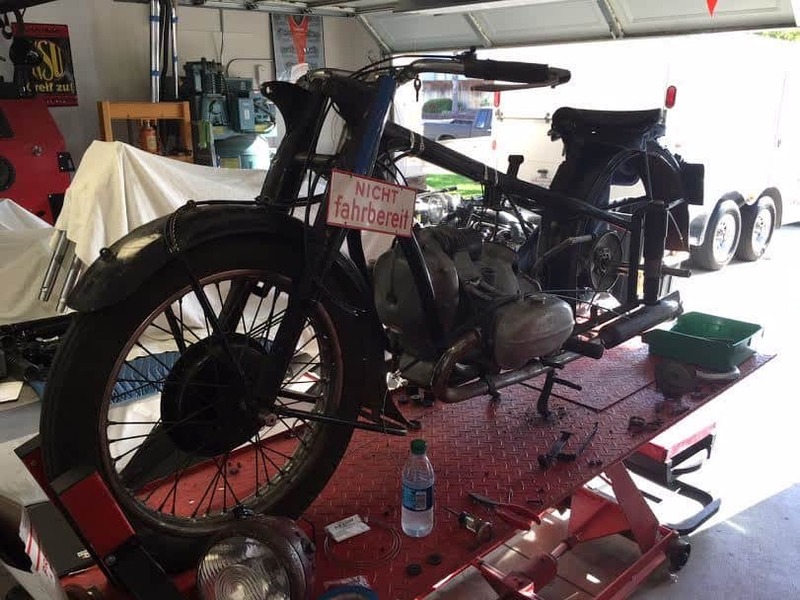 Together we constructed a very detailed history of this historic motorcycle. Robert was so helpful and we consummated a valuable email friendship. At my request he wrote a multi-page history of the R5 for my archives which I recently posted here on the Turtle Garage blog. 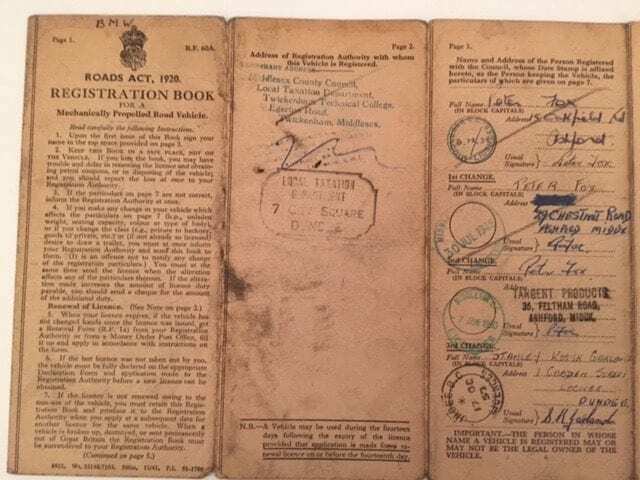 Besides owning several BMW’s and having deep knowledge of the British BMW Owners Club, he has also recently become the official registrar of the AFN archives. AFN Falcon Works was the only authorized British importer of BMW products in the 1930’s. The AFN records have been preserved and extensive information can be found on each pre-war BMW that was imported to England. This data can be cross referenced with BMW’s own detailed archives in Munich. Through the AFN archives, Robert has been able to find original invoices, service records, and ownership data for my R5, R71, and also for this recently acquired R51. 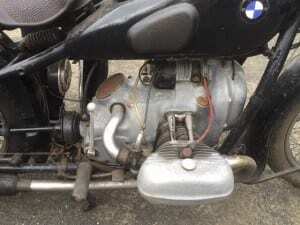 The 1938 BMW R51 is essentially an updated sprung version of the groundbreaking R5. This motorcycle is an incredible addition to my collection. As the sole licensed importer for BMW, AFN only imported 217 motorcycles into England between 1935 and 1939. Thanks to Robert’s help, I now own three of these highly documented original AFN bikes. I strongly prefer these AFN British examples because they have a pedigree that can be proven. In the coming decades I believe this authentic historical documentation will prove crucial in materially increasing the value of these rare motorcycles. Pre-war BMW motorcycles are becoming more desirable and are starting to catch a bid for serious money. This positive trend has increased the number of fraudulent bikes coming out of Eastern Europe. Since most pre-war BMW’s were sold new inside Europe, many were damaged or destroyed in World War II. 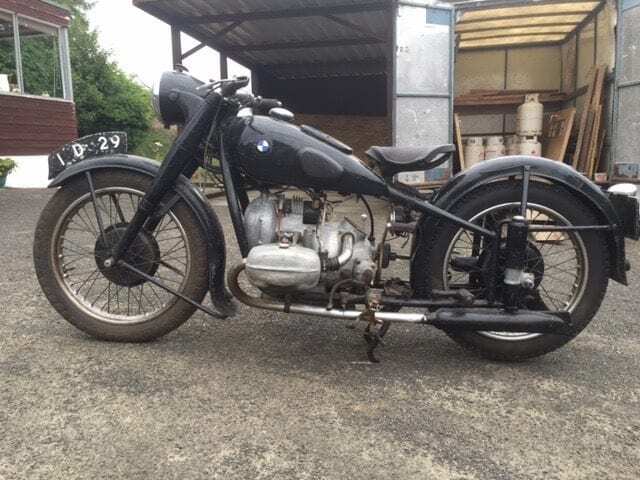 As a result, many of the pre-war BMW’s in Europe do not have a traceable history and often have a dubious provenance. The unlucky machines that ultimately ended up on the eastern side of the Berlin Wall were picked apart by the Soviets. Engines were often removed from the bikes and used as water pumps or generators. What is left today are many examples that have been cobbled together with non-original parts. Several of the European pre-war BMW’s that remain have incorrect engine and frame numbers that do not match the records at the BMW archives in Munich. However, the 217 BMW motorcycles that were sold new into England via AFN were spared the fate of their European brethren. The same tend holds true for the handful of BMW’s that were sold new into Argentina, South Africa, and other far flung countries. In the case of my three AFN British machines, each has a rich and complete history that Robert has helped me uncover through the British BMW Club archives, AFN records, BMW archives, and his own personal knowledge of the chain of ownership. In short, Robert has been beyond helpful in piecing together the histories of my AFN BMW’s. 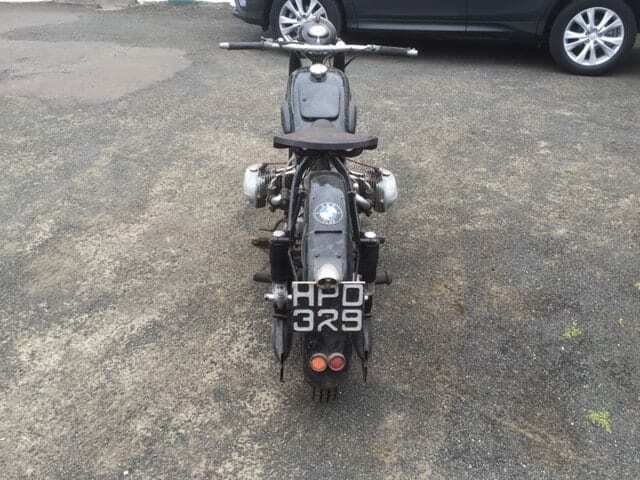 Recently he was instrumental in helping me acquire this rare and original two-owner BMW R51 (British registration HPD 329). With his help, I purchased HPD 329 directly from its 80-year-old second owner Stanley K Garland. What follows is Robert’s written history of this latest acquisition. The R51 is currently in transit and will be shipped directly to Mike Dunn in Los Angeles for restoration. 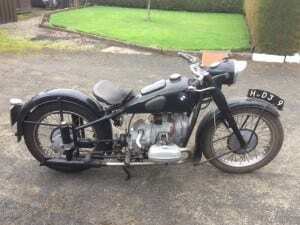 This fine example of a late 1930’s BMW was built in Munich on Wednesday 24th August 1938, but it was not until Friday or Saturday 18/19 November of that year it was delivered to AFN Ltd. Falcon Works, London Rd. Isleworth.Surrey. England. The R51 followed on from the ground breaking clean lines of its predecessor, the R5. The production run of engines was 3171 units, and this model is just on ¾ of the way into that. The frames were used across the range including the R61, R66, and R71. The new design feature was rear suspension, a ‘spring frame’. Engine and transmission closely follow its proven predecessor. This came at a price, £123/0/0. By comparison, the new Triumph Speed Twin was £75/0/0. The average wage was £208/16/00 per annum. £4/0/0 a week. The USA average earnings were $1731.00, equals £346/0/0 in Britain. £6/13/0 a week. For comparison, an R61 was £118/0/0, an R71 also £123/0/0, while the R66 was top of the range at £135/0/0. That was in June 1938. There are 74 of the R51 models, including several of the R51SS, recorded in the AFN Archive. The last one sold was Monday 21st August 1939, by Kings of Oxford, at their Manchester Branch. War was declared two weeks later on the 3rd September. Now a little history on the Company. The initials, AFN stood for Archibald Frazer Nash. He founded the Frazer Nash Cars. They were unique in having a chain drive to the rear wheels. Successful in motor sport, in the 1930’s Frazer Nash approached BMW for license to use their new 6 cylinder sports engine, and build Frazer Nash BMW cars. The factory started to supply r/h drive body’s, and engines, assembled on Isleworth, but, part of the deal was also to promote and sell BMW Motorcycles. This came into being in 1935. The earliest record is an R17 sold in October 1935. By August 1939, when all imports and sales ceased, some 217 machines had been imported and sold, from the humble R20 to the R71. However, this cannot be said to be 100% accurate, as in the last few years two BMW’s including this one, have come to my attention. I am Registrar for BMW’s sold by AFN UK Ltd, Both pre and post war up to 1960. In 1938 AFN had Dealers across England selling BMW’s. Oxford, Southampton, Nottingham, Liverpool, Birmingham to mention a few. Many of these were still in business in the 1960’s. How long did HPD linger in the showroom. Only a few days. Friday 4th November 1938 it was sold to a Peter Fox of 15 Oakfield Road. Ashford Middlesex, a suburb of West London, south of Heathrow Airport, not to be confused with Ashford, Kent. The distance from AFN to Oakfield Rd is only just over 8 miles. Mr Fox owned the machine till the early / mid 1950’s, when he sold or exchange it for goods and cash to the 2nd owner. It was most likely ordered and not just an impulse purchase. AFN would have had perhaps one of each model as demonstrators, but not carried stock in any number. Mr Fox was what we call in England, a ‘Jack of all trades’. Meaning, he could fix anything, well. 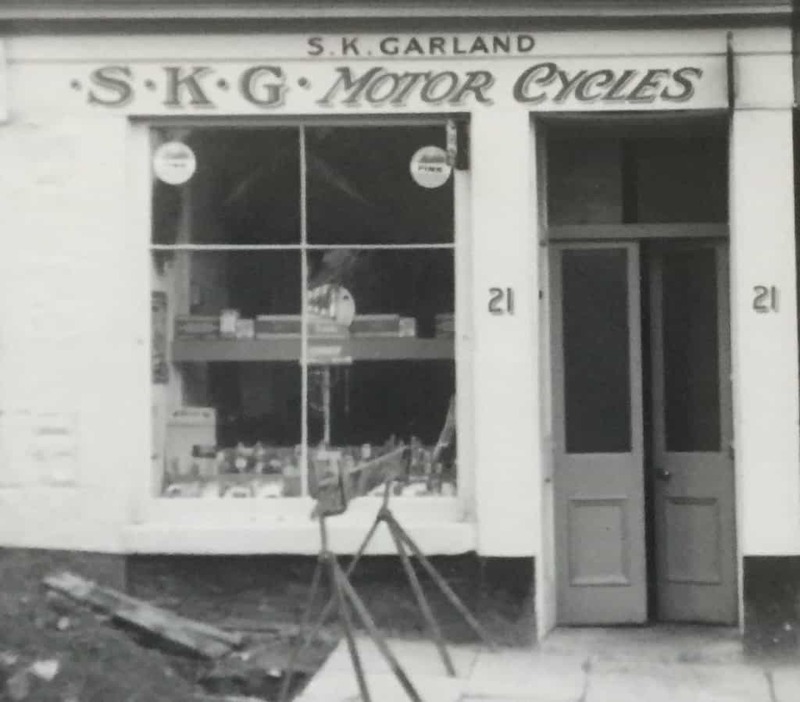 By 1948 he had moved to 29 Chestnut Road, Ashford, just around the corner. On 7th June 1950 he moved yet again to 35 Feltham Rd. Ashford. Around the next corner, the address also included in the title, a stamp for Targent Products. Perhaps his engineering back round brought home to him the quality and fine design offered by the R51, influencing his choice, there were after all some very good home products then. To see another BMW on the road would have been a rare event. Here is a man who was master of his craft, a skilled precision engineer and his skills were in demand elsewhere. His home town was Dundee in the North East of Scotland. He set up the new Targent Products Company H.Q with a lock up Nissan Hut in Buttars Loan, Dundee. A Nissan hut was not a Japanese idea, but to quote Mr Wiki, “A Nissen hut is a prefabricated steel structure, made from a half-cylindrical skin of corrugated steel. Originally designed during World War I by engineer and inventor Major Peter Norman Nissen, it was used extensively during the World Wars”. There are still many in use in the UK. Targent Products did contract work for the company, Ferranti , a major Dundee employer who in the 1950’s focused on the development of airborne radar subsequently supplying radars to most of the UK’s fast jet and helicopter fleets. Peter Fox made springs for them that would have fitted a watch, that small! What the purpose was, we will never know. This is where the 2nd owner, Stanley Garland, enters the scene. Born in 1936, by the early 50’s he was the proud teenage owner of a BSA C 10 motorcycle, 250 ccs. 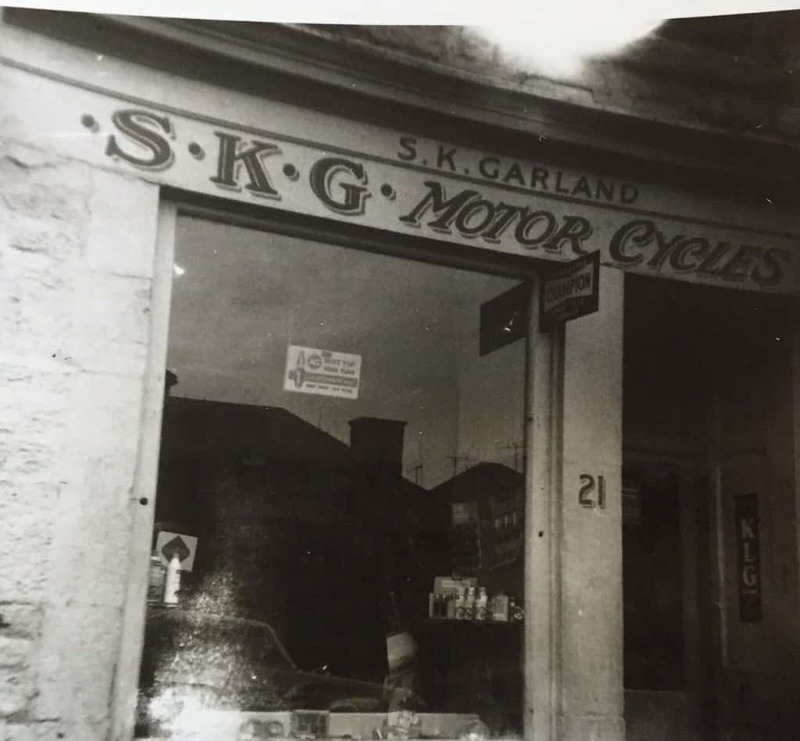 Mr Garland lived close by to Targent Products, and finding the battery on the machine would not hold a charge took the bike to Mr Fox. How fortuitous that proved to be. However, Mr Garland and Peter Fox knew each other, from both living in Dundee. Peter Fox had then moved south to London, eventually returning to Dundee. It was diagnosed that the polarity was reversed, it had negative earth (-) as do BMW’s. British bikes were positive (+) earth. This was very quickly fixed, and a long friendship developed between the teenager and ‘master’. 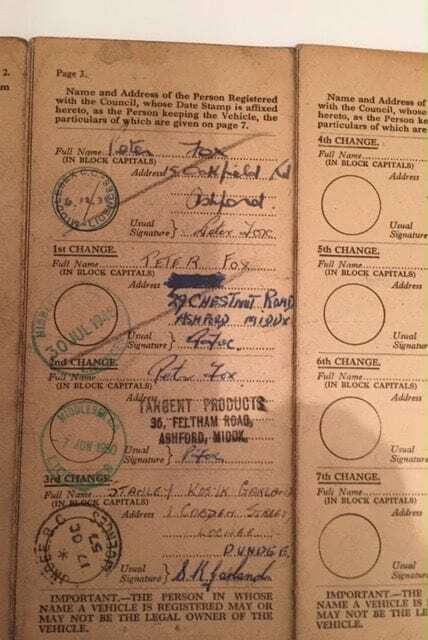 Peter Fox eventually left the UK and went to work in South Africa involved in Gold Mining. That was the last we hear of him. HPD 329 was registered at 1 Cobden St, Lochee. Dundee on 1th October 1957. Stanley in time started working for British Railways, based at St Pancras and Euston Station in London. He was commuting every 6 weeks from London to Lochee, along the A1 trunk road on the BMW. He fitted flat Norton handlebars, and a duel seat, for comfort, and to enable him to get flat on the tank over mile after mile up and down to Scotland. Fortunately, he kept all the original equipment which now is reunited with the R51. 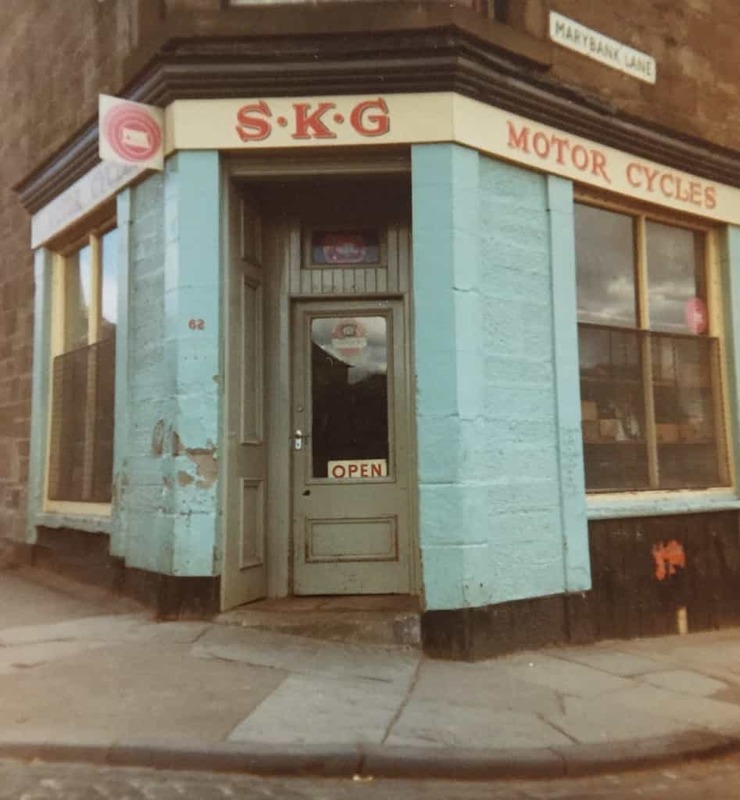 Stanley, still based in Dundee and looking for a new challenge and set up not one, but two , Motor Cycle Shops in Dundee, one at 21 Cobden Street, the other at 62 Liff Road and named the Business’s S.K.G. Motor Cycles after the initials of his full name. He had a lock up garage in Rodd Rd, Dundee. In the photo a chalked message on the side reads “Back at 6.30 Thur” Inside on the left is what looks like it could be a trials bike. He offered, sales, repairs, part exchange, but the money spinner was Insurance. The market was buoyant in the 50’s, 60’s and 70’s. Every young man wanted a bike, Mods and Rockers in the UK. Mods rode scooters, dressed sharp, Rockers were as the name suggests, influenced by music and films until ‘Easy Rider’ came along. A Norton ES2, 500 ccs single was the day to day transport. But motor sport intervened, being both ‘fun’ by financially rewarding. 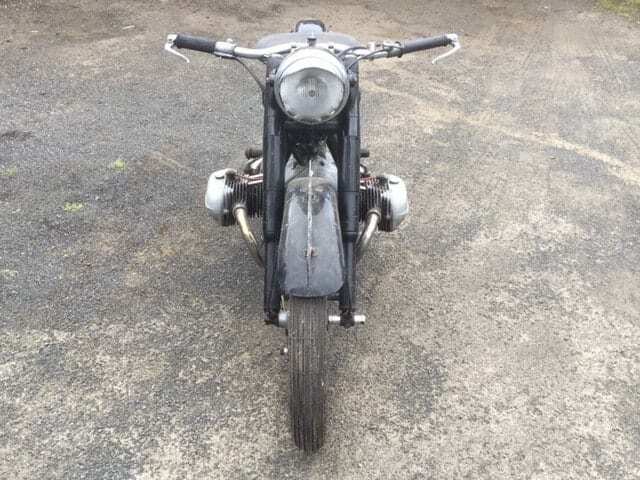 Stanley told me he rode Grass Track in the summer with a 500 ccs Speedway JAP engined machine and 250 ccs Triumph. He could pick up perhaps £15/0/0 at meeting in prize money, when his wage was £2/0/0 a week. But Grass Track was not enough. Road Racing on local Aerodrome Circuits, known as Clubman’s Meetings, with a Triumph Speed Twin and a Triumph Tiger 110 fitted to sidecar. But that was not enough either. 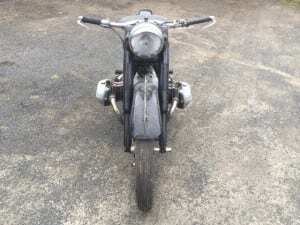 The ES2 had the frame shortened and this became a Trials Bike for winter events. This sounds so much like people I knew at that time. His sporting days eventually came to an end with a nasty crash at speed road racing. The R51 went into retirement about 1958/59, for many years it was displayed in the window of the Liff Road shop. 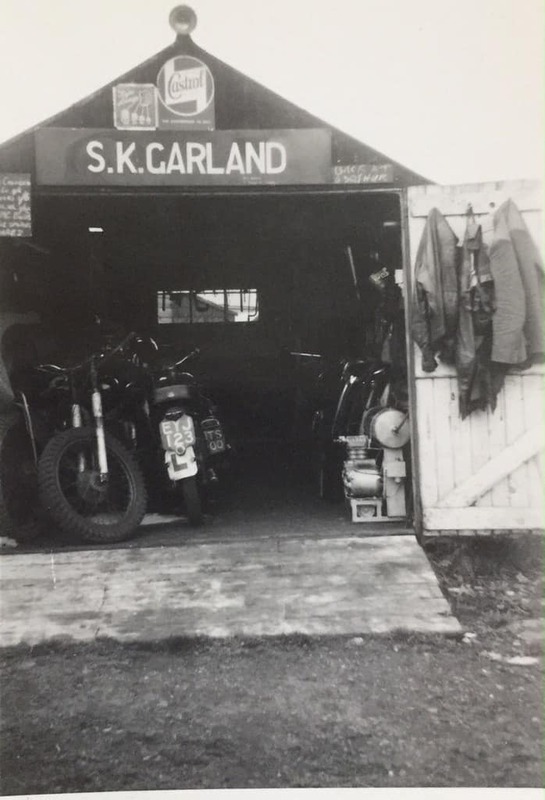 In later years, the BMW moved with Mr Garland, to his now home, where it has dwelt in secure dry accommodation being regularly wheeled out and the motor run. It was in August 2015 it came to my attention, and knowing Philip Richter has a fine collection of early BMW’s, he owns an R5 I rescued in 1966, I mentioned to him that this very original low mileage, correct AFN import was on the market. Protracted emails established the bona fide, after which I left it to Philip Richter’s decision. I feel sure he will give the machine the care and attention it deserves, bearing in mind the very complete history we have. I thank Mr Stanley K Garland for being so forthcoming in answering my never ending questions. ‘Just one more thing?’ was repeated ad infinitum. I also pay tribute to Mr Garlands Nephew, Alfie Iannetta who carried out the actual electronic side of the business. I was able to draw upon personal and family experience based upon over fifty year with motorcycling in G.B and BMW’s in particular. 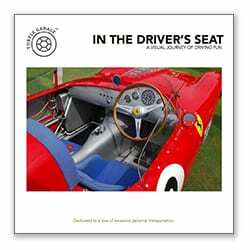 Finally, my access to original AFN Archives, and relationship with BMW Archive in Munich, has enabled me to pen an insight on the motorcycling scene just prior, and for the two decades after W.W.2 through the eyes of Stanley K. Garland. Philip Richter is President and co-founder of New-York-City-based Hollow Brook Wealth Management, LLC. The Turtle Garage Blog, he says, is dedicated to his "love of excessive personal transportation." Join the conversation! Click here to cancel reply. Hi, I own a a 1938 R51 too and was very interested to read your article. I hadn’t realised until recently that the bikes were imported by AFN. The R51 is in my workshop which overlooks the AFN site! The bike is complete although the seat and handlebars are not original but the frame/engine numbers match. 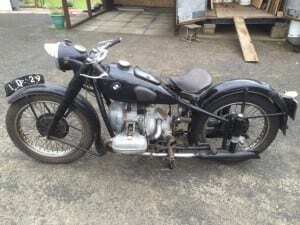 I have quite a lot of spares for this bike and a 51ss including a complete gearbox. 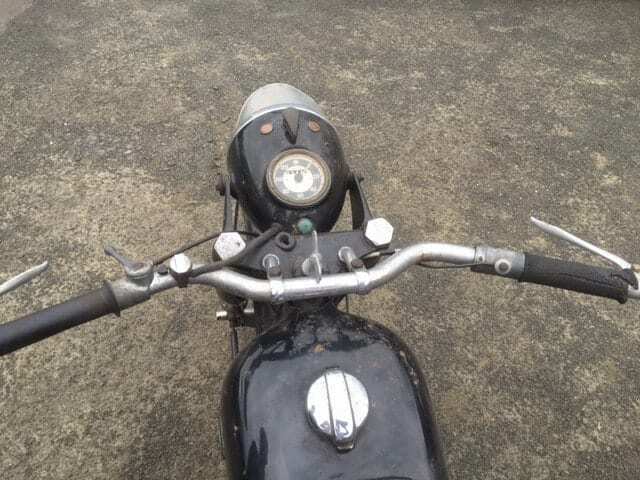 I,d be very grateful if you could help me learn the history of the bike and in particular whether it was imported via AFN? Hi Chis mi name is Milan Polakovic i am living in Scotland near Dundee and I am building BMW r51 from parts if you have some parts for sale that will be great !07842414419 mpjoinery745@gmail.com Thank you regards Milan. Thanks for the article, very interesting indeed. 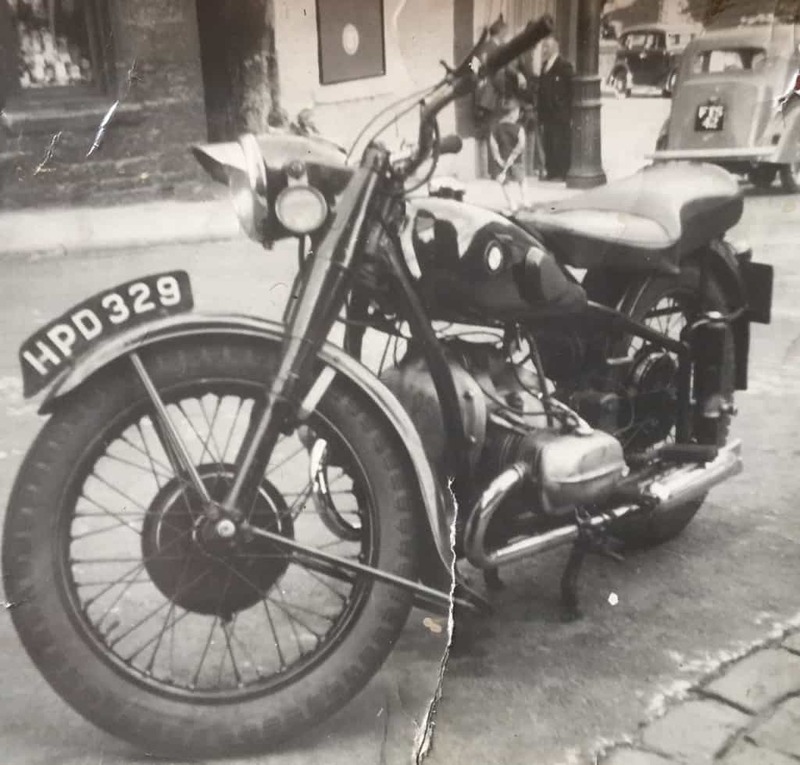 My mother has only very recently, after many years of searching, come across a photograph of the motorcycle, clearly showing the UK registration plate. I would be very interested to make contact with you to see if you can help shed any light on the bikes history to get me started. I’m based in the UK and can be reached on…. Mike did you get my email? I followed up a few weeks ago. You should contact Robert Freeman, I bet he knows some history on this bike. Hi, really nice barn find. It looks orginal with nice patina. Only headlamp seems to be post war R51/2. 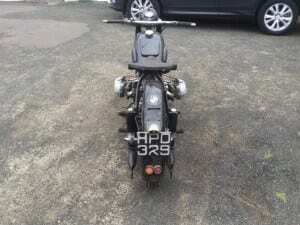 I am a pround owner of GKK813 1939 R51 which need loads of work and under restoration. That is a great find! What is your plan for this one? We are going to determine if the paint is original. We think it might be a fully original untouched machine. If that is the case we are going to give it a mechanical restoration but leave the patina alone. If it has been repainted in the past we are going to do a full 100 point restoration. 1966 ICON Old School Bronco: Rediculoulsy​ well sold! ©2018 TurtleGarage.com. All Rights Reserved. Website by GREAT 8 CREATIVE.